Jakarta - In the market iPad tablet superiority is indisputable. Most of the currently available tablet is definitely using the iPad. But it is not going to last for up to five years. NPD research institute estimates that Apple's share in the tablet space will be reduced to 50% by 2017. While the Android-based devices and Windows will menggergoti starting in 2014. 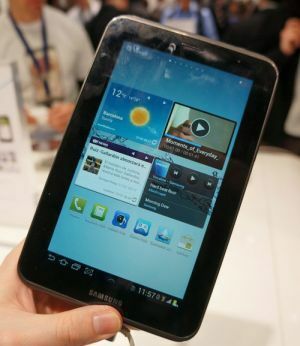 NPD estimates that the overall tablet market will swell from 81.6 million units in 2011 to 424.9 million units in 2017. The report noted that worldwide tablet shipments will surpass the notebook in 2016 driven by a series of feature enhancements, the diversity of operating systems and production capacity. "So far the tablet into a relatively young product category, tablet PC market has been dominated by Apple and are likely to include a number of similar competing products configured for the iPad," said NPD analyst Richard Shim, who quoted from Apple Insider, Sunday (6/5 / 2012). "However, because competitors iPad better adapt to consumer preferences and find opportunities to break new ground, we expect the landscape to change dramatically, giving consumers more choices, which will drive demand for more devices," he added. NPD estimates that Apple's share will be in the range of 72.1% in 2012 to 50.9% in 2017. While Android and Windows will grow from 22.5% to 40.5% and 1.5% to 7.5%.